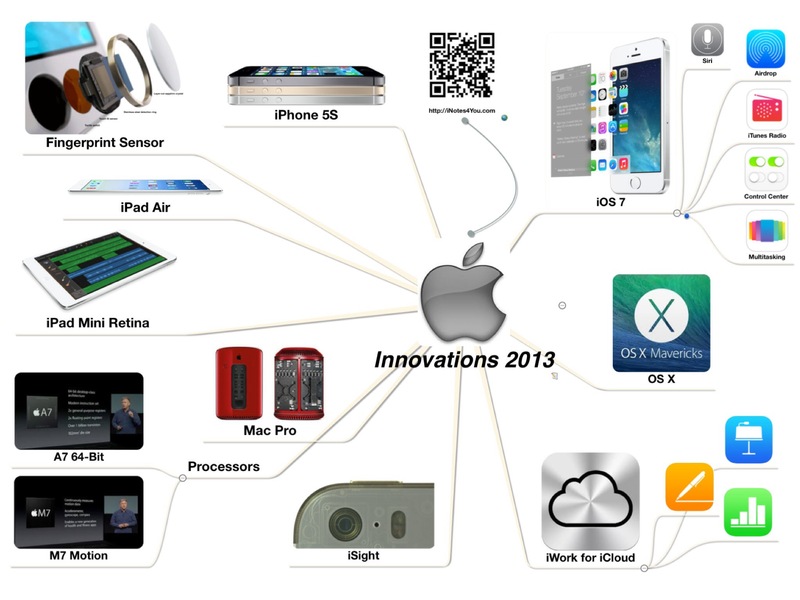 Apple is an innovative company and discussions about its innovate power first need a close look on what innovation means for a tech company. Innovation is the application of better solutions that meet new requirements, unarticulated needs, or existing market needs. This is accomplished through more effective products, processes, services, technologies, or ideas that are readily available to markets, governments and society. The term innovation can be defined as something original and, as consequence, new that “breaks into” the market or society. One usually associates to new phenomena that are important in some way. A definition of the term, in line with these aspects, would be the following: “An innovation is something original, new, and important – in whatever field – that breaks in to (or obtains a foothold in) a market or society”. Innovation differs from invention in that innovation refers to the use of a better and, as a result, novel idea or method, whereas invention refers more directly to the creation of the idea or method itself. Regarding the major tech companies Apple, Samsung, and Google we can see an ongoing war between fanboys each claiming their beloved company is innovative. In the organizational context, innovation may be linked to positive changes in efficiency, productivity, quality, competitiveness, market share, and others. However, recent research findings highlight the complementary role of organizational culture in enabling organizations to translate innovative activity into tangible performance improvements. The measure of innovation at the organizational level relates to individuals, team-level assessments, and private companies from the smallest to the largest. Measure of innovation for organizations can be conducted by surveys, workshops, consultants, or internal benchmarking. There is today no established general way to measure organizational innovation. Corporate measurements are generally structured around balanced scorecards which cover several aspects of innovation such as business measures related to finances, innovation process efficiency, employees’ contribution and motivation, as well benefits for customers. Measured values will vary widely between businesses, covering for example new product revenue, spending in R+D, time to market, customer and employee perception and satisfaction, number of patents, additional sales resulting from past innovations. So we are faced with a complex topic but what should be clear is that a final assessment whether a company is innovative can only be done by knowing all the facts and waiting until the society respectively the market shows any reaction. In 2010 Apple released its first iPad and some years later we can definitely say that it was innovation born out of many preceding scientific results, above all the touch screen and the appropriate software to control apps. An innovative product is only born if it provides space for essential improvements in the future. So in an essential first step the conditions for a long-term impact already must run in the blood. It needs a close look on and into products to see innovative steps which, in some cases, are only laid out. If the basis already includes technically feasible visions, the new product usually will be successful. A more superficial view on the iPhone 5S, Apple’s flagship, could lead to an assessment like “same shape, same size, same everything”. But the truth is that there is a fingerprint scanner solving the dilemma of security in a much more convenient way than before and the M7 motion processor which could later be used in a new kind of device like an iWatch, possibly disrupting the health care system. And be sure, it will not be a shiny new gimmick like the Galaxy Gear watch. And there is iOS 7 supporting a 64-Bit architecture, designed for future software capabilities. And there is much more only visible if colors and shapes are disregarded. Here are the steps to innovative products. in any innovation process is to generate ideas. This includes gathering ideas both internally and externally, within the company and by looking at competitors. The ongoing war between fanboys e.g. of Samsung and Apple only reflects a psychological problem of the involved people because collecting information from everywhere is a normal process in which lastly lead to the many benefits we have in our modern society. No scientist would ever get a Nobel Prize if he wouldn’t refer to results of his colleagues. Then it’s inevitable to prioritize and make sense of these ideas. The goal must be to find a structured way to catergorise and prioritise your ideas, so that your long list becomes a shortlist. is to incubate the best ideas. Incubation could just be further theoretical development, or it could move into piloting or an initial roll-out of the idea. That’s what Samsung did with its Galaxy Gear Smartwatch. But also Apple with its M7 motion processor and the fingerprint scanner first introduced in the iPhone 5S in late 2013.
needs excellent engineers and designers to focus on an issue, a solution and implement your idea fully. is an essential step for a business oriented company. It’s effective marketing. A product shouldn’t be called innovative if it doesn’t have an impact on society. This needs a significant number of customers, worldwide. It’s one if the strengths of Apple to push customers with sophisticated ad. The Motorola Atrix with its fingerprint scanner is an example for a good idea but poor marketing and the result is well-known, it was a product without significant impact. in any innovation process is choosing to either exit or sustain the project. Innovation can’t go on for ever! Even if the project becomes self-sustaining, at some point you will need to send it back through the innovation process to check that it is still relevant, delights people, is useful for their everyday lives and perhaps make plans to adapt or replace it altogether. In these circumstances, the innovation process is very much an iterative one. The iterations of the iPhone, and not to forget, of the environment (stores, iCloud, iOS 7, 64-Bit processor, etc) are a shining example of this last step a company is faced with. Looking on more than 4 decades of Apple there is no doubt about a constant improvement of all hardware products, software and services. This long-term strategy made the company to the most valuable brand in the world. connect the dots in a way that people are excited, benefit from a new technology, let them change the way to do things more efficiently or even with more fun and engagement, and inspire them to think different and force creativity. And it’s not only the iPad initiating a paradigm shift there are also Apple’s desktops which have to be taken into account. When the iMac appeared it made everyone look. It was meant to be a “look-at-me” product. It was meant to show Apple was not dead. Last year Apple showed off their new professional grade desktop machine and those who do serious computing and media production have been lining up to get them. Apple is still making the finest desktop machines in the field. For those in America, where is there a huge problem with respect to personalized health care? Like – everywhere! In other developed countries with public health care the emphasis on personal responsibility has been the best way to both reduce costs and make the system more efficient. In America you have to go through the gauntlet of health care providers and insurance providers and pharmaceutical companies to take charge of your own good health. If Apple’s iBeacon software is installed in the next ambulance to arrive at my home then my phone might light up with my emergency information automatically once I am inside the vehicle. I might not even be conscious. But my phone can give them what they need to know to start treating me. My phone might also tell them I have had high blood pressure for the past six weeks and rising. All this with a personal tracking iStrap and the M7 chip on my phone. 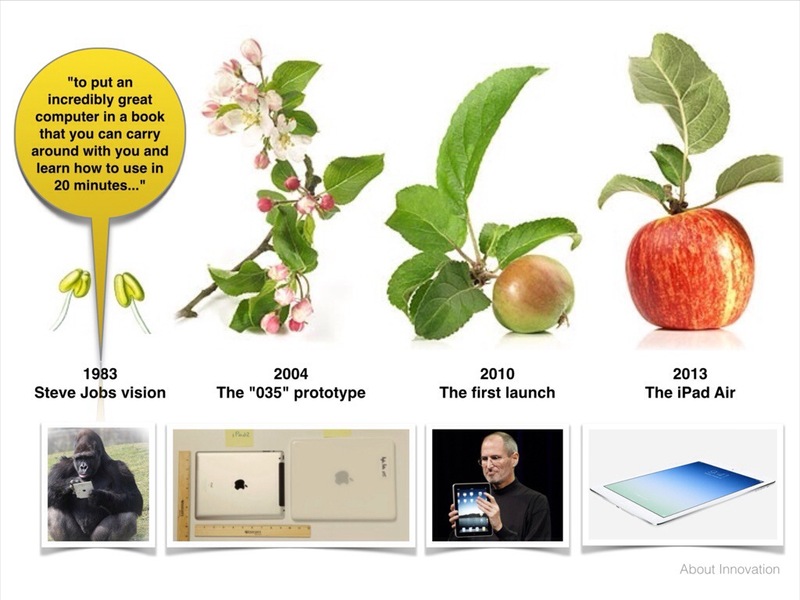 I am thinking Apple has been slowly and carefully putting the seeds into the ground for some years now which will later be sprouting a completely new category of personal device(s) which we cannot live without. So let’s put all these considerations together. If you are a regular visitor of my blog you already recognized that I like to do it with a map, a mind map or a concept map. It needs a close look on all the activities of Apple, it’s leaders as well as it’s excellent engineers, to screen a picture on what the targets of innovation are. 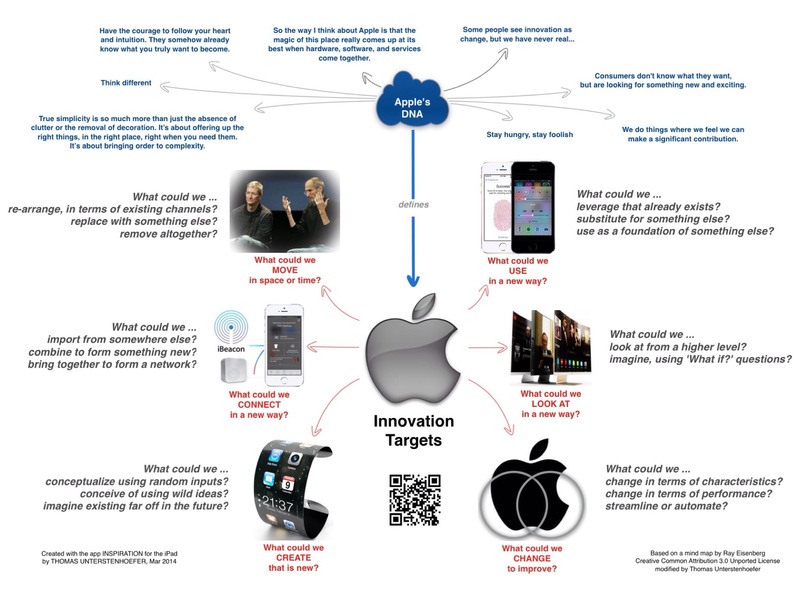 I added some quotes of Steve Jobs and Apple’s Industrial Design Group (IDg) to point to some basics of the company’s philosophy which is primarily influenced by Steve Jobs and Sir Jonathan Ive. It needs a company DNA and blood flowing through the veins of responsible people to be innovative. This DNA is followed by innovation not only brought into sold products but also into the corporate structure and the infrastructure customers are faced with. This all is also a lesson for successful leadership which compels admiration and a cult-like status. If this happens over decades a company becomes a brand and in case of Apple the most valuable brand in the world. The worst case hampering innovation and customer satisfaction are early releases of unfinished products with less benefits for customers and follow-ups which manifest the lacks of predecessors. So an essential part of innovation is simply time even if there is an increasing pressure from which side soever, market, shareholders or deliberately provoked by publishing (or in case of Apple one could often say ‘punishing’) media. I purchased my first Apple device (an iPhone 3GS) in 2010 and started blogging in late 2012 with just one target, to learn more about the company and its mobile devices, an exciting journey through technologies of an amazing company. 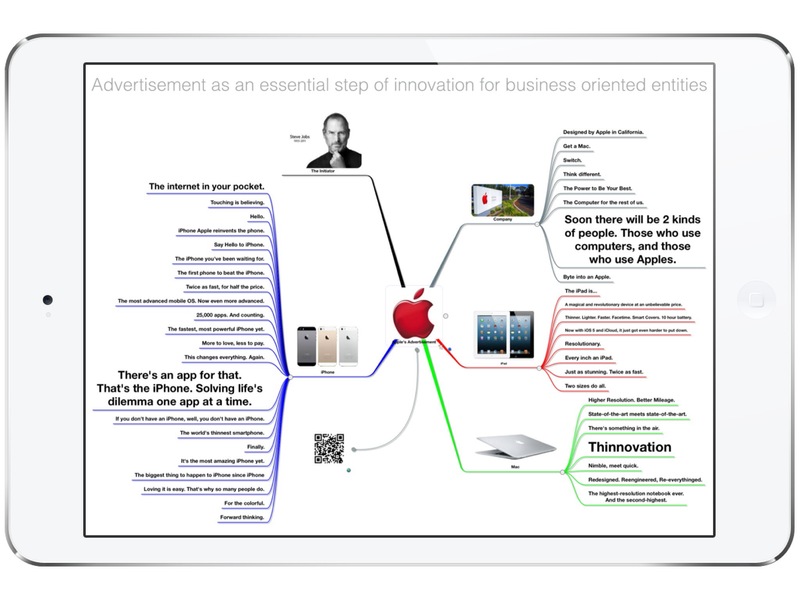 So this concept map is based on what I learned and published on iNotes4You. See the different articles under ‘Related links’. I tried to connect each topic with an Apple product which, I think, is a meaningful example for what the content stands for. To decide whether a technical product is innovative or not is a quite difficult task and in many cases it’s also a very personal assessment. Innovative features of products might change the life of an individual and can be useless for others. And there are developments which can be seen as useful for all people like a smartphone automatically sending information to health care assistants in case of an accident. Previous Post Tap Zapp Software Inc.